Having taken the Singapore First Class on 777-300ER, we decided to try out the 777-300ER business class seats from SQ as well. If you’re wondering how we accumulated sufficient miles for these premium seats, check out our post on how to accumulate miles with Singapore travel credit cards! 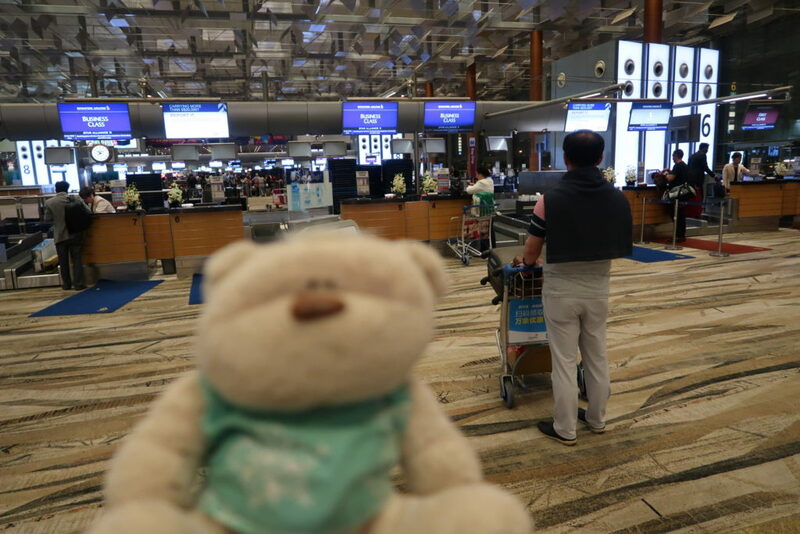 Check-in at Changi Airport is always a breeze. It is even more so with Singapore Airlines. This time, we were taking the business class flight from Singapore to Beijing and from Beijing to Busan. Although we were unable to check-in for our second flight to Busan online, we were glad that we were able to do so at the airport. Upon receiving our query, the staff went ahead and printed out our passes for the next flight which actually helped us to catch the flight on time! This we will illustrate in our next post. The food variety in business class SilverKris Lounge was fantastic! You can find fruits, salads, sandwiches, coffee, tea as well as hot food selection from Western, Chinese and even Indian cuisines! During our visit, we had crispy fried chicken wings, bbq chicken wings, siew mai, prawn noodles, char siew bao, sweet and sour pork as well as sea coconut dessert. Our favourite dish during this visit was the XO fish noodles. Not only was the noodles smothered with the fragrance of the XO sauce, the noodles itself was so ‘Q’! (‘Q’ is a slang for bouncy or springy texture) In fact, we had so many servings of the XO fish noodles, that we lost count of the actual number. Soooooooooo gooooooood! Other alcoholic selection includes wines, hard liquor and draft beers (from automated beer machines!). There’s even the Courvoisier XO fine champagne cognac that retails for $350/bottle! Firstly, we noticed that the leg rest space was different. Vastly different. Whether we were in the seated or sleeping position, we realised that unlike the first class seats, our legs could only be stretched into the corner. Moreover, the storage space beneath the leg rest space was alot smaller as well. Secondly, the finishings were also not as plush as first class. Whether, its the leather seats or the “gadgety” parts of the seats, there were still visible differentiation that could be seen. Lastly…no BOSE earphones! But we have to qualify that the noise-cancelling earphones were still very effective! This time, we also ordered the roast lamb chop, which was tender and did not have any gamey taste at all. Probably the best roasted lamb chop we’ve had. Period. Whether on land or in the air. We were actually disappointed with the braised beef noodles. Although the beef itself was tender and flavourful, the noodles were clumpy and tasteless. As a result, we finished the beef and left the noodles largely untouched. We hope you have enjoyed our review of the Singapore Airlines 777-300ER Business Class Review. In our next post, we’ll review the next Air China business class flight from Beijing to Busan. Lounge Istanbul Ataturk Airport : One of the Top Airport Lounges in the World! Airport Lounge access with ANZ Travel Card!